Recently I was in the simulator with two other instructors. One was my First Officer, the other was the Sadist … ahem … Sim Instructor. We were running without the ECL (paper QRH for NM and NNM) and the APU was failed. Climbing through about 5000ft, Los Angeles for Sydney – we received  ELEC BUS L on the EICAS – the loss of the Left AC Electrical Bus. Fortunately I was flying and so my long suffering FO was forced to deal with not only this failure, but all the consequent failures, through the paper QRH. ” That’s It? ” my fly-buddy observed. I advised him to look at the roof. Of course with the loss of one of the two main electrical busses in a modern (fly by wire) aircraft – there are a whole host of ancillary services lost. Many of these are reflected by the amber lights on the overhead panel. Having looked at the roof – you later discover even then that it’s not the whole story. In this particular scenario we decided to return to KLAX. Part of the return process was fuel jettison down to maximum landing weight. Guess what? Without the Left Bus – the main tank jettison pumps are failed. You’ll be advised of this … when you start the fuel jettison. I didn’t give this a second thought (I think I’ve been stuck on the same aircraft for too long) but it was interesting the discussion we had afterwards about this little quirk of the Boeing EICAS/ECL. There are no EICAS/STATUS messages to advise you of everything you’ve lost, and in many cases until you attempt to use something that’s failed – you won’t know about it. Older aircraft used to publish a Bus Distribution List (Electrical and Hydraulic) so that you’d know exactly what you’d lost with a particular electrical bus failure – but not on the 777. My fellow pilots were vaguely disturbed by the lack of information. We discussed it. Our decision to return was primarily based on passenger comfort. The entire aircraft had lost galley power, IFE and other passenger services and we decided it was unrealistic to continue 14 hours to Sydney without them. Would knowing that we weren’t going to be able to complete a fuel jettison have affected this decision to return … no. We came up with scenarios where knowing fuel jettison was compromised would lead to a different diversion airport, but in the main they were pretty far fetched. In most cases it would have resulted in diverting to that other airport anyway using some of the fuel we were unable to jettison. It’s an interesting system design/human thought process discussion. It’s one of those cases where you presume that the manufacturer has gone to great lengths to ensure the Need To Know list is complete and correct, and accounts for all the possible permutations of the operational environment. Practices & Techniques : You Can’t Always Get What You Want. 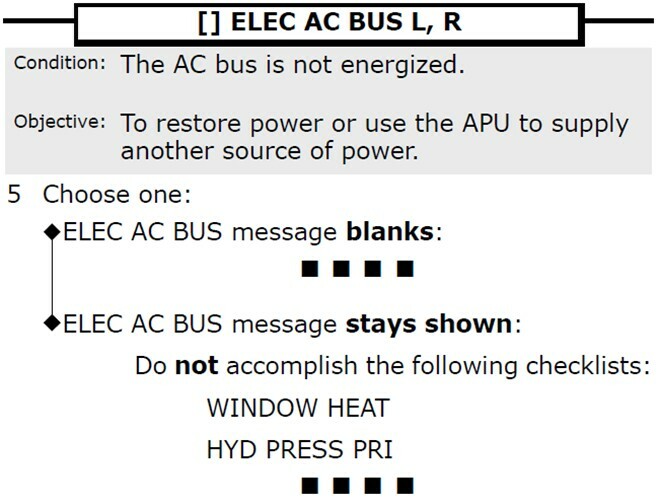 Clearly I’ve eliminated the intermediate steps from the checklist, but from the picture here you can see that with this failure – if you are unable to recover the Left or Right Bus – you’ll lose Window Heat and a Primary Hydraulic Pump (Left or Right for both of these, depending on the Bus lost). No biggie, right? Well, now look at the roof. Of course with the lost of an entire AC BUS – you lose a whole host of services. The amber lights on the roof give you more information, but for the most part, you won’t be told what you’ve lost until you try and use it. 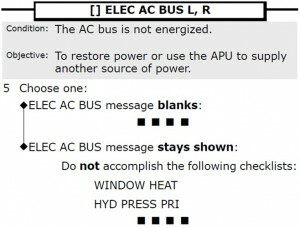 Case in point – ELEC AC BUS L disables your ability to jettison fuel from the Main Tanks. Fuel Jettison will commence but eventually the system will fail and you’ve probably be left with a requirement to run the Overweight Landing Checklist – albeit with significantly less fuel that if you hadn’t attempted Jettison. Many pilots feel they should be told during the ELEC AC BUS L checklist that they’ve lost Fuel Jettison – but should they? 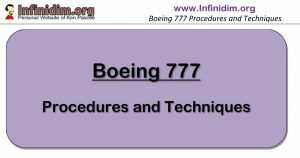 That’s an interesting discussion – but the point is that you won’t always be given everything you want to know about NNM events in the aircraft. Often at the conclusion of a NNM – particularly an electrical or hydraulic system failure – a general synoptic and overhead panel review can reveal more detail about what just took place.